I’m Paul Wilson and I work as Area Manager for the South Atlantic in DIO’s Service Delivery team. Many people probably don’t realise the extent of the Ministry of Defence’s overseas bases and training areas. These include Canada, Kenya, Germany, Belize and here in the South Atlantic. 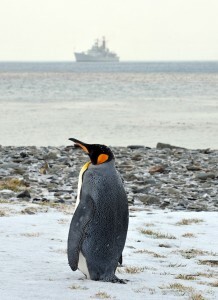 My job is managing Defence infrastructure on the Falkland and Ascension Islands. Most of my career has been spent managing infrastructure projects on various MOD bases in Germany, so my current posting to the South Atlantic is a bit of a change! I’ve been here since 2011 and while it has its difficulties, I’m glad I came. The job is extremely challenging - managing an infrastructure organisation and delivering real results 8,500 miles from the UK, in an austere environment with a very limited contractor base and supply chain, is as hard as it gets. Most of our works are delivered by UK suppliers with protracted lead-in times so planning is critical to success. On a personal front, the Islands can be beautiful; wild and sometimes dangerous, but beautiful nevertheless. The wildlife is truly spectacular and living and working here allows you the opportunity to see and experience these creatures in their natural habitat. 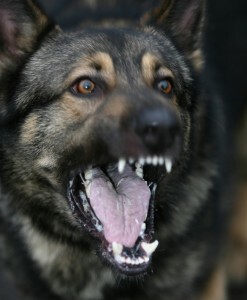 One recent project was building new kennels for the Royal Air Force (RAF) Dog Section in the Falkland Islands. 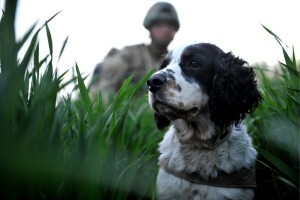 You might be surprised to hear that the Falklands garrison needs dogs but they are very useful. Some are used on patrols while others are used in the same way as Police use dogs in the UK, such as hunting for missing persons, tracking suspects and detecting drugs at the airport. The previous kennel structure was more than 30 years old and needed replacing with a modern building which is cheaper to run. The planning stage took nearly a year and construction began in November 2013. We worked together with a private company called Interserve to complete the building. We’re really proud of the final facility which has been designed to be as environmentally friendly as possible. It uses eco-friendly systems such as passive infrared lighting detectors and a rain water harvesting system. Not only are these features better for the environment, they will also save money for the MOD. Before the building was handed over from DIO to the RAF, it was fully tested by Shadow and Figo, who as you may guess from the names, are animal members of the Dog Section! The facility has 22 normal kennels, two isolation kennels, a grooming area, dog wet room, laundry, treatment room, isolation area, storage areas and food preparation room. It’s very highly regarded – my team and I are very proud of this project. 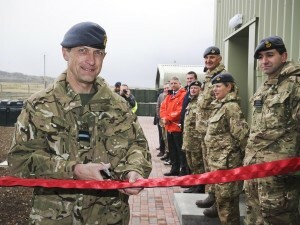 The new kennels were opened by the Commander British Forces South Atlantic Islands, Air Commodore Russell La Forte, CBE, in full military fashion, with a ceremony and a tour. Successes like this remind me why this is a truly unique posting that I would recommend to anybody.